The perfect Pineapple Upside-Down cake is sweet, moist, and a bit gooey, with a touch of tang from the pineapple, and oh so pretty with its yellow rings of fruit and spots of bright red cherries. Alton Brown insists a cast-iron skillet is necessary to do the job, but I’ve had some pretty awesome ones from a plain ol’ cake pan. Here is Alton Brown’s family recipe for Pineapple Upside-Down cake, which is the recipe we used for our September 8th segment on the Tucson Morning Blend. Be sure to read down to the end of the recipe! 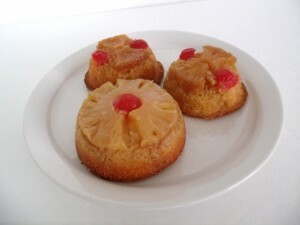 We added our own notes and tips, as well as our thoughts on making Mini Pineapple Upside-Down cakes. Enjoy! Drain the pineapple slices, reserving the juice. Prepare the sugar glaze part by melting the butter in a 10” cast iron skillet. Add the dark brown sugar and stir until it dissolves, about 5 minutes. Remove skillet from heat and carefully place 1 pineapple slice in the center of the pan. Circle the other slices around the center slice. Put a cherry in the center of each pineapple slice. Combine the flour, baking powder, and salt in a medium sized bowl. Combine the eggs, pineapple juice, and sugar in another bowl, mixing well with a whisk. Then add the dry ingredient mixture, and stir just to combine. Pour the batter over the fruit and bake for 35 to 40 minutes, until a toothpick inserted comes out clean. Once removed from the oven, let it cool slightly, about 5-10 minutes. Set your serving plate or platter on top of the pan and carefully invert the cake. Will keep for 5 days, tightly wrapped at room temperature. Be sure to purchase the pineapple rings that are in 100% juice, then you can use this juice in the cake batter. Instead of a cast-iron skillet, you can also use a regular 10” aluminum cake pan. Just don’t put this on your stove top to mix the butter and sugar!! Mix the butter and sugar in a sauce pan and then pour the mixture into your cake pan. In place of mixing the melted butter and brown sugar on the stove top, you can also simply pour the melted butter into your cake pan, then sprinkle the brown sugar on top of the melted butter. This is also a great way to prepare your pan, using a pastry brush to brush the butter around the sides of your pan before adding the sugar. Use fewer cherries by cutting them in half, then placing the cherry half cut side up in the center of your pineapple. Don’t want to bake from scratch? Then use a box mix of either white or yellow cake. Follow the box directions, but substitute most or all of the water with pineapple juice. Be sure to turn your cake out onto your serving plate before it has completely cooled, or it may stick to the pan. If any of the gooey sweetness does get left in the pan, simply scrape it out and spread it on your cake while still warm. Make Mini Pineapple Upside-Down cakes in either jumbo muffin tins, or standard cupcake pans. Follow the same procedures, dividing the butter and sugar among the cups. You will need to cut a little wedge out of the pineapple slice for the jumbo pans to fit it into the cup. Cut smaller pieces of fruit to fit into the standard sized cupcake pans. Also adjust your baking time down to 20-30 minutes, depending on the size pan you use. Also test with a toothpick. We inverted our mini cakes onto a sheet pan, then transferred them onto a serving plate. You can get 1 to 1-1/2 dozen mini cakes with this recipe.